The kid is 34 years old, is what I started to type for this story, and I stopped myself. 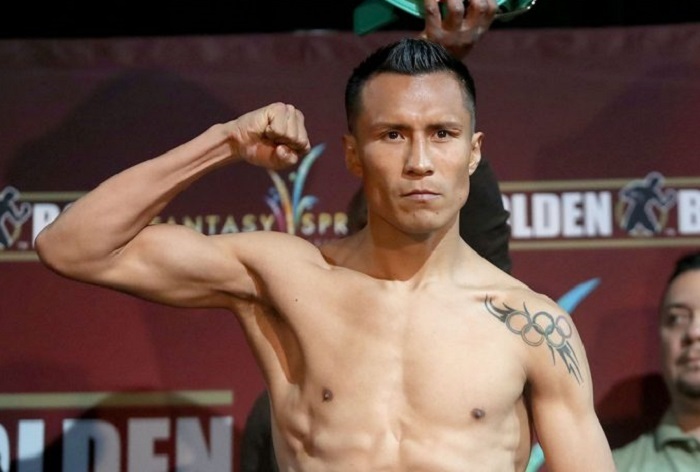 Francisco Vargas is 34 and yeah, not a kid. But the 25-1-2 (18 knockouts) boxer trained by Joel Diaz is an ultra seasoned pugilist and thus, how he’s handled, and expectations for him going into his May 11 rematch with Miguel Berchelt (35-1, 31 KOs) must be adjusted. A pro since 2010, Vargas lost via stoppage, in round 11, against Berchelt in Cali on Jan. 28, 2017. He scored Ws over Stephen Smith and Rod Salka, that being his last outing, in April 2018. So, it’ll be a lengthy time away from active scrapping when Vargas seeks to prove that seasoning can edge relative youth versus the 27 year old fellow Mexican. “To get the win Francisco knows he has to work extra hard, harder than the first one,” Joel Diaz told RING, regarding the fight which takes place in Tucson, Arizona. Vargas popped on more radars when he beat Juan Manuel Lopez in 2014; in 2015, he battled Takashi Miura with the WBC super feather crown up for grabs, and he won by TKO9. He drew with ultra vet Orlando Salido and then dropped the strap to Berchelt. In that tango, Berchelt had the edge in strength and power and he looked a bit fresher, like the younger lion. In a rematch, Vargas will want to be shoring up the D, fight smarter – not harder – and not allow Berchelt free looks at his head and torso. I was curious, did trainer Diaz like how Vargas responded mentally to the loss to Berchelt? “He is a Mexican warrior, it’s a pleasure working with him, after the loss he told me exactly what went wrong in fight and camp. He tried a new strength and conditioning coach…nowadays they are using a system that does not fit for boxing. Conditioning coaches are very different in training for baseball or soccer, you train a boxer completely different. Instead of helping them it’s not benefitting them at all. “Young strength and conditioning coaches get the opportunity to train boxers and sometimes they try too hard to impress you, they overdo it, overtain your fighter. You have to have certain limits. A fighter needs proper training and rest. They can be over-trained, tight, be drained, having done too much work. Joel also handles Diego De La Hoya, who is back in action April 13, on the Jaime Munguia undercard. He is quite enthused by prospect Israil Madrimov, and enjoys working with Russian and Eastern Euro fighters, because of their work ethic and humility. You probably want to have Joel Diaz on your trainer watch list, come to think of it, because in a year’s time, a bunch of his guys will probably hold belts, and his profile will get a bump because of it. And a win by Vargas, an underdog versus Berchelt, would accelerate that process. Follow Woods on Twitter if you like. He calls fights on Facebook Fightnight Live.